Have you ever wondered what goes on behind the countless vehicle changes you make online? Or the variation application you submit digitally to open a new operating centre? Or the updates you make to your licence record through VOL? Our digital team work hard to make sure those online services are always available so your business can keep running smoothly. 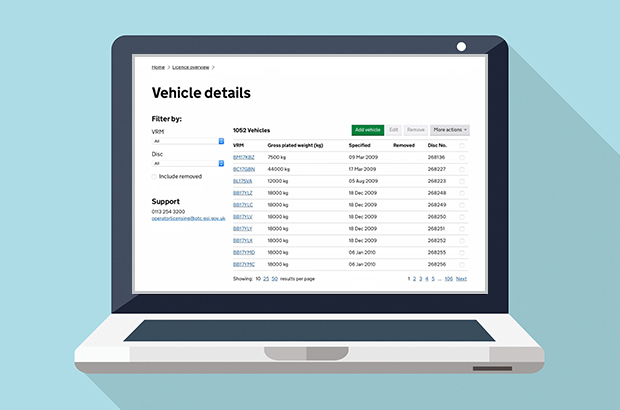 And because we’re a service on GOV.UK, the team is constantly looking to improve the vehicle operator licensing (VOL) system. To do this we listen to what you need. That’s how we develop new services. Our team visit operators like you and find out how your business runs and what challenges you face when operating commercial vehicles. With this information, we make VOL better and provide more efficient ways to manage your licence. We recently introduced the Verify service to allow transport managers to use digital signatures. 83% of users said they’d be willing to use this service to sign applications. Verify is already in place for new applications and licence continuations. Our developers work out what you need to do as a user to carry out a task, such as completing a digital signature. Then they write down what’s needed to develop it. Once it’s built and added to VOL, they test it to make sure there aren’t any problems. After that, it’s made available to you, our users. At the moment, the VOL team is focused on introducing digital licence surrenders. This means you’ll soon be able to apply online to give up a licence you don’t need any more, instead of filling in the paper forms. It’s one more step towards making all of our major transactions digital and part of continuously improving the service. VOL’s not just a service used by operator licence holders and transport managers. The database behind the system actually helps DVSA examiners at the roadside. When a vehicle’s stopped, they’re able to check if it’s properly licensed using their smartphones. Over 700 enforcement staff have access to live data from VOL at the roadside. That’s because the traffic commissioners and DVSA have an agreement to share data which helps the agency to carry out its enforcement work effectively. One of our most important jobs is to find out how you’re using the service and what you think of it. Our user research shows 82% of you are satisfied with your experience of VOL and you’ve given us some really positive feedback. Take up for our digital services is at 82% too. We’re delighted so many of you are using VOL. If you want to be part of our user research in the future and help us improve our services, please email: webpublishing@otc.gov.uk or leave your comments below. VOL is a great and easy to use system but it’s concerning that this error 20 message is still causing issues for some of us. Do we have any idea yet as to what the issue is and when it will be sorted? It could be a major confidence boost to those who are considering using VOLs for the first time, if there was a simulation facility. Operators and applicants who may be nervous of tech, could familiarise themselves with VOLs operation without the perceived risk of commitment etc. Hello Mike. Thank you for your comment. Example videos on how to apply for a licence and make changes to a licence are available on the DVSA YouTube channel (professional Drivers and Operators section) and we'd encourage anyone thinking about using the digital service to look at those. Applicants can also run through an application on GOV.UK at their pace as the application can be saved throughout prior to formal submission. There's also online guidance throughout to assist with that process. Do you still need to display a paper O license disc in the window? Yes. Any vehicle specified on a licence should display an operator’s licence disc. Thanks Chris for answering my question. I would like to be able to print a properly formatted vehicle list. Currently it seems to print a bit like a screen print, including the side and bottom slides. Hello Wayne- thank you for your comment. If you click "More Actions" and select "Export" this will give you a CSV file with details of all your vehicles which can be easily viewed in Excel. I have found VOL to be a very efficient service and quite easy to navigate the various screens. To date I have no negative interactions with the system. Thank you Peter. We'll add you to our list and we'll be in touch soon! We have been advised to add trailers onto VOL but there is currently no check to make sure there are no duplications or a search function, if this is a requirement for earned recognition can the facility be the same as for vehicles? The ability to search for trailers is not currently a feature of the VOL system. As we work to improve and develop the system to meet user needs and priorities, a search function for trailers may be examined.